In the Salesforce Report Builder, create a new report based on an object that you want to track. 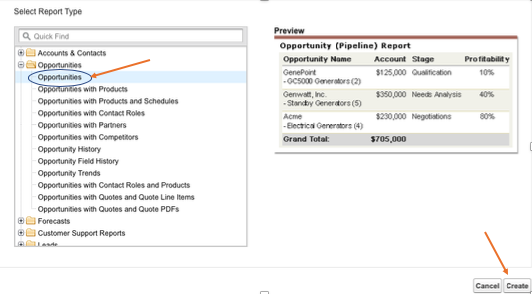 Example: Select the Opportunity object if you want to build a report on Month-to-Date Sales. 2. Change the format to “Summary”. This is the only format supported in Hoopla at this time. 3. Add Date Range criteria. Example: Date Field - “Close Date” and Range - “This Month"
4. Add any other applicable criteria that will narrow down the results to the right set of records. 5. Summarize the fields that will feed your Hoopla Metrics. Example: If you want to track Month-to-Date Sales, you’ll want to summarize the Amount field with the SUM for each Opportunity Owner. Additionally, the field used for grouping (Opportunity Owner in the example below) must be a Lookup (User) Field. 6. Run the report and save it. Recommendations and Tips: Save it to a report folder called "Hoopla Reports" to keep things better organized. Make sure to name the report something specific that explains what the report contains and the timeframe that it encompasses. In the above example, Closed Won Opps QTD would be a good name. If you would like to track Closed Won Opportunities for other time periods, make a copy of the report and change the "Range" to the new time period, then save with the new appropriate name. Once run, the final report will look like the example below. A User Lookup Field will always be an underlined clickable link that brings you to a profile page for a user. The other two fields that would come in from the report would be "Record Count" and "Amount" in the example below. Only information in the dark blue, will be brought into Hoopla. 7. Repeat steps 1-7 for any other object types you want to track (e.g., Tasks and Events, Leads, Cases).